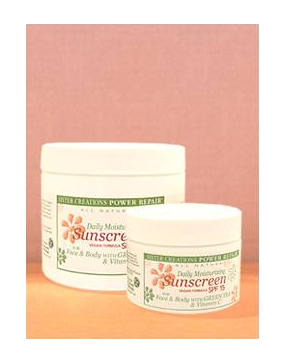 A natural herbal sunscreen moisturizing & nourishing the skin. Used properly, it is an effective protection against harsh exposure to sun, wind, & water. Excellent for sensitive skin. CONTAINS: Purified spring water, plant infused oils of organic comfrey leaf, green tea, & horsetail. Olive oil, jojoba oil, hempseed oil, sesame seed oil, African shea butter, cocoa butter, rice bran wax, active sunblock ingredients (titanium dioxide & zinc oxide) vitamin C (ascorbate), essential oil of lavender & grapefruit seed extract.